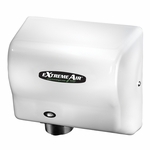 The Microburst 3000 Aerosol Dispenser uses state-of-the-art Smart Chip technology to maximize odor control effectiveness, reduced cost-in-use, and provide visual and audio indicators to minimize labor cost. Hi-tech dispenser creates a "We Care" image. Real time clock for maximum programming flexibility. Up to 168 days between refill changes. Liquid Crystal Display provides visual of battery life and days remaining to change refill. One dispenser controls up to 6,000 cu. ft. of space. Strength of batteries. Days remaining until you need to insert a new refill. Adjustable Spray Interval "LO" = Low Odor problems (sprays every 28 minutes). "ME" = Normal situations (sprays every 14 minutes). "HI" = Problem areas (sprays every 7 minutes). Days of Operation Allows you to operate 12 or 24 hours-a-day. Can operate 5, 6, or 7 days per week. You select the number of days to operate. Audio Indicator One beep is emitted for low batteries while two beeps indicate an empty refill. Can be deactivated. Long Battery Life Monthly battery replacements are a thing of the past. Smart Chip technology extends battery life up to 3 years on 2 C-Cell alkaline batteries…a big cost saving feature! Weight: 1.0 lbs. Color: Chrome. Battery Requirements: 2 "C" Cell Batteries Unit: Each.